Six senior technical and legislative staff from the House of Representatives participated in the study tour on food and nutrition security organized by the Philippine Legisaltors’ Committee on Population and Development (PLCPD) in Benguet province, April 25-28. The two sites selected, provincial capital La Trinidad and municipality of Tublay, have been consistently commended for their agriculture, nutrition and disaster risk reduction and management (DRRM) programs and policies. 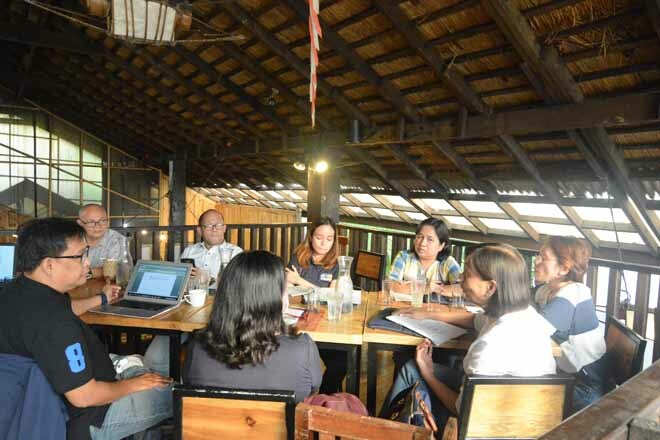 The participants dialogued with the provincial officials of Benguet including the Provincial Health Officer, Provincial Agriculture Officer and Provincial DRRM Officer as well as their counterparts at the municipal level in both La Trinidad and Tublay. The provincial officers shared about the support services they provide to farmers such as soft loans and technical assistance, capacity-building for municipal and barangay level workers, and information dissemination on health and nutrition in medical missions and in health centers. Mayor Edna Tabanda of La Trinidad discussed how the local government, in cooperation with Benguet State University, supports farmers in improving the quality of their produce through organic farming and facilitating the marketing and sale at various commercial outlets. The municipal officers of Tublay talked about their innovative agriculture and nutrition programs that hinge on the convergence of various sectors and on the adoption of national programs and frameworks to suit the needs of their citizens. Their nutrition program called “A Joint Undertaking for Women’s Health and Nutrition” or AJUWHAN has helped increase the Tublay’s exclusive breastfeeding rate from 70% to 89.4% and decreased the number of underweight children from 28 to 11 since its inception. Study tour participants were also invited to the municipal agriculture center where they produce compost, vermicompost and mokusaku, a Japanese-introduced technology of using wood vinegar as pesticide and soil conditioner. Study tour participants also interacted with the organic farmers of La Trinidad and Tublay at their respective farms. The farmers expressed their appreciation for organic agriculture and interest to continue its practice. They lamented limitations in financial and physical resources, such as irrigation facilities and more appropriate and marketable seeds. These discussions enriched their understanding of the state of food security, organic agriculture, and the implementation of key policies on food and nutrition security. Some existing laws that need to be revisited as identified by the participants include: Republic Act (R.A.) 8178 (Agricultural Competitiveness Enhancement Fund), which offers loans and scholarships for agriculture; R.A. 9729 (People’s Survival Fund), which can provide additional funding for LGU projects related to climate change adaptation; R.A. 10068 (Organic Agriculture Act), which can facilitate the lowering or subsidy on certification fees of organic agriculture associations; and R.A. 9184 (General Procurement Reform Act) to ease the release of funds during emergency situations.